Getty ImagesRichard Fisher, president of the Federal Reserve Bank of Dallas. TORONTO -- The U.S. Federal Reserve is poised to evaluate and potentially make changes to its massive monetary stimulus, a top Fed official who is critical of the Fed's bond-buying program has said. To counter the financial crisis, the Fed dropped short-term interest rates to near zero in late 2008 and has since bought more than $2.5 trillion in bonds to bolster what has been an anemic economic recovery. Financial markets have been increasingly on edge on expectations that the Fed is ready to start scrolling back on its stimulus. 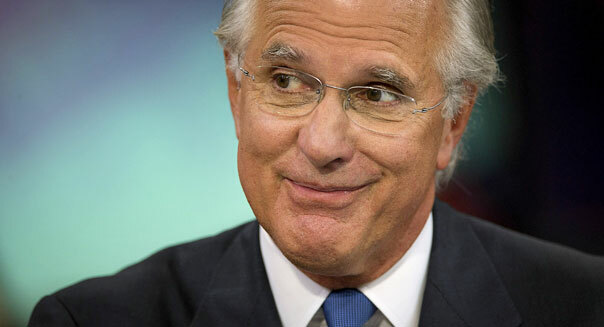 "The plot now thickens," Richard Fisher, president of the Dallas Federal Reserve Bank, said Tuesday. He likened developments in the Fed's monetary policy to a Shakespearean play starring a "daring captain," Federal Reserve Chairman Ben Bernanke, steering the ship of the U.S. economy. "Act IV, just beginning, will involve the drama of introspection, with the FOMC evaluating the utility of its navigational tactics, and, perhaps, fine-tuning them, if not altering the course," Fisher said, referring to the Fed's policy-setting Federal Open Market Committee, in remarks prepared for delivery to the C.D. Howe Institute directors' dinner in Toronto. Fisher isn't a voting member of the committee this year. "Only time will reveal the efficacy of current policy and whether the risks that I and more experienced observers like Paul Volcker fret over are as substantial as we surmise, or whether we have made much ado about nothing," he added. Volcker was the chairman of the Fed from 1979 to 1987. Fisher is a longtime critic of the Fed's current bond-buying program, the Fed's third round of quantitative easing, known as QE3. He argues it has done little to help the economy and poses a risk of doing great harm. He told the Toronto audience there was a "practical limit" to the size of the Fed's balance sheet and investors shouldn't expect "QE infinity." He later told journalists he had advocated for the Fed to begin slowing the rate of purchases of mortgage-backed securities, but not stop them. Asked if he was concerned about the impact of rising bond yields on the economy, he said it should be monitored but that policymakers couldn't let markets dictate policy. "We cannot live in fear that, gee whiz, the market is going to be unhappy that we are not giving them more monetary cocaine," he said. Fisher said he wasn't surprised to see a rise in bond yields given that they are near historically low levels, adding that as a former hedge fund manager he would be cautious. Last week Volcker, who led the U.S. central bank's aggressive battle against inflation, also sounded a warning on QE3, saying that central banks are often too late in removing stimulus. Fisher on Tuesday didn't repeat his call, made most recently last month, for the central bank to cut back immediately on its $85 billion in monthly bond purchases, though he did reiterate his concerns. While chances are "extremely low" that monetary policies will help push inflation above the Fed's 2 percent target this year, the bond-buying program is, "at best, pushing on a string and, at worst, building up kindling for speculation and, eventually, a massive shipboard fire of inflation," he said. He noted that while there was disinflation in some categories such as food, he wasn't worried as this was emboldening consumers. Uncertainty about U.S. fiscal policy is keeping businesses from hiring, he added, negating the power of the Fed's super-easy policies. Even so, recent job gains and retail sales suggest the recovery is strong enough "to propel hopes that consumption will help employment growth gradually improve over the long term," Fisher said. Unemployment is expected to remain at 7.5 percent when the U.S. government releases its May jobs report this Friday. Bernanke last month said the central bank needs to see further signs of traction before easing up on its monetary stimulus, but also said a decision to do so could be made at one of the Fed's "next few meetings" if the economy looked set to gain momentum.